A Success related support Unit appears that helps offensively and defensively. Cont (RC): If this card is Successful, all of your Units with the Success ability gain Power+2000 and “Cont (VC/RC): Resist”. Act (RC) 1/Turn: [Soul Blast 1] During that turn, this Unit becomes Successful, but when that turn ends, this Unit is Retired. For Today’s Card, we’re introducing from The Character Booster “We Are!!! Trinity Dragon” (on sale January 13th, 2017): “Lesser Writer”, who supports 《Great Nature》’s 【Success】. “Less Writer” is a Unit with the 【Success】20000 ability (Success is an ability that becomes active when an ally Rear-guard’s Power becomes a certain value. In this case it’s Power 20000.). If this Unit becomes Successful, all of your Ally Units with the Success ability gain Power+2000, as well as 【Resist】. Of course it raises its owwn Power, making it a 11000 Power attacker who can easily Hit. And, with 【Resist】, you won’t have to worry about having your Units Retired during your turn due to G Guardians like “Flame Wing Steel Beast, Denial Griffin”. 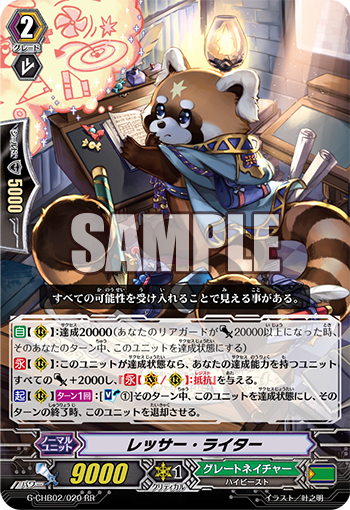 You can expect it to be a powerful support card in a Deck with many cards with 【Success】, so it’ll often be useful. And it has one final ability that lets you Soul Blast 1 card to have it become Successful on the condition it Retires at the end of turn. Even if you have trouble reaching a Successfulness of 20000 Power, you just have to Soul Blast 1 card, to force it to become Successful. Of course it comes at the cost of Retiring it, so be careful about when you activate it. The Character Booster “We Are!!! Trinity Dragon” contains many cards that support 《Great Nature》’s 【Success】. Look forward to future information! ※ December 31st, January 2nd and January 3rd, there will be no new Today’s Card, apologies. But January 1st is expected to introduce a card! So please enjoy!